Memory is the ability to retain and to recall personal experiences, information, and various skills and habits. While memory is easy to define, there is no agreement among researchers to explain how it works, and scientists have not yet established a model for the actual mechanics of memory that is consistent with the subjective nature of consciousness. Dr. Daniel L. Schacter, a Harvard professor of psychology and an expert on memory, states that subjectivity in the process of remembering involves at least three important aspects: Memories are mental constructs fashioned in accordance with the present needs, desires, and influences of the individual; memories are often accompanied by emotions and feelings; and the actual act of remembering something usually involves a conscious awareness of the memory. In the twenty-first century, some scientists favor the comparison of the brain to a computer and memories as programs that have been encoded into the system. Behaviorists argue that memories, and the thinking process in general, are products of learned behavior. Many researchers have long observed that the more traumatic an experience, the more likely an individual is to recall it later. Neuroscientists point to numerous current studies that indicate that memory involves a set of encoded neural connections that can occur in several parts of the brain. The more powerful the images accompanying an event, the more the brain is stimulated and likely to make it a part of long-term memory. Although scientists have yet to understand how memory really works, a survey of psychologists conducted in 1996 revealed that 84 percent of them believed that every experience a person undergoes throughout his or her life is stored in the mind. However, a great many current studies suggest that such is not the case. An increasing amount of research on memory indicates that every moment of every bit of sensory data experienced by individuals throughout the course of their normal day-today life process is not retained by the brain and is not able to be recalled at some future time. Rather than the brain serving as a kind of repository for a complete audio or video recording of everything that has ever happened to a person, the only memories that are stored are bits and fragments of one's more meaningful experiences that are somehow encoded in engrams within the neural network of the brain. 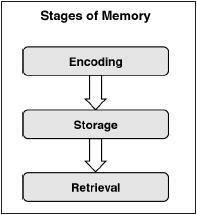 The process of memory involves an act of consciousness that withdraws a significant or emotional event in an episodic montage or collage of images, rather than a complete recall of sensory data. Scientists believe that long-term memory requires an extensive encoding in the inner part of the temporal lobes of the brain. Most memories are lost, because they were never successfully encoded. Strong encoding of a memory may depend upon the individual's interests, perception, and needs. Thinking and talking about an experience at the time it occurred will also assist in an encoding that may be recalled at a later time. Scientists believe that they may have discovered a biological reason why two people who witnessed the same event may, several years later, have different memories of what really occurred. According to research conducted at the Center for Neural Science at New York University by Drs. Karim Nader and Glenn Shafe, every time an older memory is recalled and is brought into consciousness by an individual, the brain reassembles it, updates it, and makes new proteins before placing the memory back in long-term storage. Dr. Daniel L. Schacter commented that the research of Nader and Shafe had offered the first good neurobiological explanation of the method in which memories may be updated. Schacter added that it is a mistake to believe that once the brain has recorded a memory it remains forever fixed. Some scientists have theorized that existing older memories may eventually be erased in the brain by a process that involves the generation of new neurons. The clearing out of certain memories to make more room for newer ones may be important in order to store more recent memories and information. Joe Tsien and his colleagues at the Department of Molecular Biology at Princeton University reported their discovery that the generation of new neurons is important for the memory-clearance process and suggested that chronic abnormalities in the clearance process may contribute to the memory disorder associated with Alzheimer's disease. Although numerous anecdotal accounts claim that dreams are a vital element in the process of encoding information absorbed during the waking hours as memories, Dr. Jerome Siegel, a neuroscientist at the University of California, Los Angeles, released his findings to the contrary in 2002. He argued that there is no solid evidence to indicate that dreams are needed to consolidate memories. In addition, Siegel contested the hypothesis that the prevention of rapid-eye-movement sleep blocked memory formation. Certain studies on memory show that people often construct their memories after the fact and that they may be susceptible to suggestions from others as to the "truth" of what actually occurred. Therefore, it is possible to create false memories in some people's minds by suggesting that certain events have happened to them when, in fact, such circumstances never occurred. Closely related to false memories, which may be instilled within certain individuals' minds, is source amnesia in which people accurately recall an event, but forget the source of the memory. People may remember the details of a terrible blizzard that their grandparents recounted so vividly to them when they were children that they later incorporate their grandparents' experience as a part of their own memories and tell the story to others as if it had happened to them. Likewise, children seeing dramatic portrayals of hardships or disasters in the theaters or on their television screens may in their adult years remember those depictions as their own memories of enduring difficult times. Scientific studies indicate that such memories of a memory that happened to someone else is common—and suggest that one's memory of an event is not the most reliable record of what actually occurred. Memory researchers, such as Schacter, list several types of memory systems. Semantic memory reveals conceptual and factual information stored by the brain. Procedural memory is the facility of recollection that permits one to learn new skills and retain habits. Episodic memory is the ability to remember those personal experiences that define one's life and individuality. In addition, scientists recognize field memory, a process of recollection wherein one, as if in a dream, sees oneself in the scene. Observer memories are those memories in which the remembrance is perceived through one's own eyes. Researchers as early as Sigmund Freud (1856–1939) have theorized that the fact that so many memories appear to be field memories is additional evidence that for many people the process of recalling a particular memory may be largely reconstructive. Freud also is famous for his theory of memory repression, in which he asserted that unpleasant memories, especially those involving sexual abuse or misbehavior, were pushed back or repressed by the psyche of the individual. Such repression could in later years lead to phobias or neuroses that could be healed by psychoanalysis. In 2001 Michael Anderson, a psychologist at the University of Oregon, conducted a memory repression experiment with college students. The study supported Freud's theory about the mind's ability to repress thoughts, especially painful or disturbing ones, according to Martin Conway, a psychologist at the University of Bristol in England. Additional findings at the University of Oregon revealed the results of a study of children that disclosed that they were less likely to recall abuse at the hands of their parents or guardians than a stranger, quite likely because the children had to forget in order to cope with their daily lives. Ashcraft, Mark H. Human Memory and Cognition. Reading, Mass. : Addison-Wesley Publishing, 1994. Loftus, Elizabeth F. Memory: Surprising New Insights into How We Remember and Why We Forget. Reading, Mass. : Addison-Wesley Publishing, 1980. "New Memories Erase Old by Generating New Neurons," UniSci—Daily University Science News. 6 December 2001. [Online] http://unisci.com/stories/20014/1206014.htm. Pinker, Steven. How the Mind Works. New York: W. W. Norton, 1999. Associated Press. "Study of Mind's Ability to Repress Backs Freud." The New York Times, March 15, 2001. [Online] http://www.nytimes.com/2001/03/15/health/16ap-memory.html. Loftus, Elizabeth F. "Creating False Memories." Scientific American, September 1997, 71–75. ——. Memory: Surprising New Insights into How We Remember and Why We Forget. Reading, Mass. : Addison-Wesley Publishing, 1980. Loftus, Elizabeth F., and Katherine Ketcham. The Myth of Repressed Memory. New York: St. Martin's Press, 1994. "New Memories Erase Old by Generating New Neurons." UniSci—Daily University Science News, December 6, 2001. [Online] http://unisci.com/stories/20014/1206614.htm. ——. The Seven Sins of Memory: How the Mind Forgets and Remembers. Boston, Mass. : Houghton Mifflin, 2001. ——, ed. Memory Distortion: How Minds, Brains and Societies Reconstruct the Past. Cambridge, Mass. : Harvard University Press, 1997. University of Washington. "New Evidence Shows False Memories Can Be Created," June 13, 2001. [Online] http://www.washington.edu.